"A gifted nineteen-year old jazz musician recently told me why he and his band play few standards. With touching earnestness, he explained that people under sixty don't relate to standards and that his generation has no connection to the classic songs of the past century. He had just played a concert of compositions written by himself or his band members. It evidently escaped him that the audience, with a sizeable component of young people, gave its most enthusiastic response of the evening to an adventurous performance of Matt Dennis's "Everything Happens to Me." As his career progresses, it may dawn on our emerging young artist that when he provides his listeners with a melody they can hold onto, they open up to him and accept considerable leeway when he goes beyond the familiar. That has been a fact of life in music at least as far back as Mozart." I am rarely able to pass up an opportunity to draw an analogy. In this instance I'm reminded of the overriding (and too often overlooked) importance of visual beauty in art. To paraphrase Ramsey; when a photographer provides visual beauty in the photographs he/she presents, the viewer will then open up and allow considerable leeway in judging that photographer's work as it moves beyond the familiar. And, this has been a fact of life in photography at least as far back as Edward Weston. Too many of today's photographers are seduced and then seemingly transfixed by the maleficent and unsightly aspects of life – to the point that their photographs appear as calculated efforts to trumpet the praises of basic ugliness, debasement, immorality, and banality. To me, enriching one's life through the virtue of beauty in art remains one of the pursuit's most basic and cherished functions. I don't know about you, but I simply fail to see (let alone understand) how my life will ever be enriched through a constant barrage of negativity and ignoble visual revelations. Yes, life has an ugly side. I know it's there. You know it's there. We all know it's there. Why does it seem that so many contemporary photographers appear to interpret this unpleasant reality to mean that we all hunger for a steady diet of shock-based outrage, insult, debasement, and overt unsightliness in the art that we engage? Are we not already exposed to enough negativity in our daily lives that we don't need to be continually force-fed the scrofulous side of life in the art we consider? Perhaps I'm being a bit close-minded here. One of the things I've continually tried to instill in my students over the years is the importance of maintaining an open mind when it comes to matters of art. And Lord knows... I've got my own opinions and prejudices just like everyone else. Nevertheless, consider the following example, which I believe directly relates to the point that I am trying to make. In his book: Emmet Gowin: Changing the Earth, a series of aerial photographs of military test sites, ammunition storage bunkers, toxic water treatment facilities, and mining operations depict a side of life often associated with ugliness and negativity. Yet, in Changing the Earth, Gowin has produced a body of work possessing an intrinsic and near staggering amount of visual beauty from which – because of his own unique treatment of the subject – the results virtually defy reconciliation. It's not that the subject matter he has chosen to photograph is so often thought of as being of a more or less unseemly nature. It is that he has presented this particular subject – in its perceived negativity – with such an abundance of visual beauty and grace that he seduces the viewer into a dichotomy. How can we reconcile this uglier side of life when we're presented with such an overwhelming array of beauty and grace in its depiction? It's a very effective and compelling body of work. It would seem then that the beauty I speak of is more a result of the photographer's specific approach to a chosen subject than it is a result of the subject matter itself. And if such is the case, responsibility for the ugliness and banality in art that I rail against here is clearly the province of the artist and should not be mistakenly attributed to any specific subject matter. 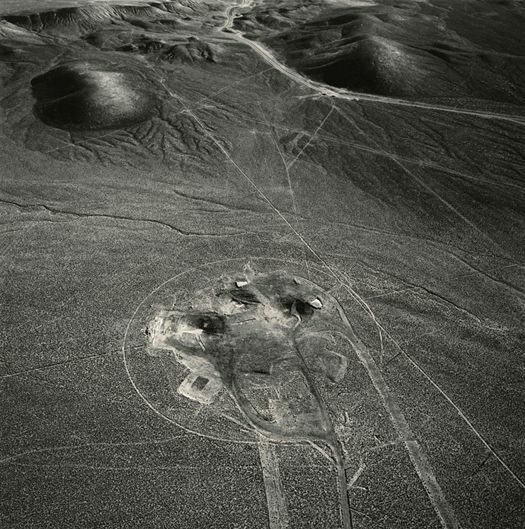 To put this in a more practical context; If I'm going to live with a piece of art on my walls, I'd much prefer to experience and contemplate the awe-inspiring beauty of Emmet Gowin's: Three Subsidence Craters, Area 10, Nevada Test Site, 1996, than I would the visually uninteresting, overtly profane, and ultimately boring and repulsive nature of Andres Serrano's: Piss Christ, 1987. Let's face it, art is a form of communication. That communication is dependent upon a comprehensible and tolerable exchange between the artist and an audience. Despite the fact that I've heard some photographers cavalierly exclaim an inexplicable disregard or lack of need for an audience, without your audience you are simply not communicating. All you're doing is shouting into the abyss! Though seemingly absent from much of today's curiously celebrated photography, visual beauty is a decidedly positive and uplifting commodity that can go a long way toward helping photographic art to achieve its distinctly inspirational and affirmative purpose. And as Doug Ramsey so keenly alluded to in his tribute to Houston Person, you stand a far greater chance of connecting with (and holding onto) your audience when you endeavor to give them what they actually want. In my own work, beauty has always remained a predominate consideration and focus. And despite having had to weather a fair amount of flak over the years for what some perceive to be a more or less trivial, or perhaps even passé pursuit, I remain content in the belief that visual beauty is the one virtue associated with meaningful art that should never be trivialized or abandoned. Good looks aren't everything. But, they're still ahead of whatever is in second place!